How to Ship a Painting or Print Framed with Glass? When shipping a painting, a print, or a photo, most people prefer doing this on their own. You simply need high-quality packing materials and some time to ensure that the piece arrives at the destination in its perfect condition, right? Well, that’s true, in some cases. However, what if you need to ship a painting by Pablo Picasso, a screen print by Andy Warhol, or any other valuable or unique artwork? Moreover, what if this painting or print is framed with glass? Are you sure you can properly prepare it for the long-distance transportation? If you have any doubts, it is better not to risk and entrust this delicate work to professional art crate and shipping companies like Fine Art Shippers! Fine Art Shippers is a professional art logistics company offering fine art shipping services in NYC, London, Hong Kong, and other cities around the world. We deal with many works of art and antiques on a daily basis and know how to ship a painting or print of any value and size. It is needless to say that our team has years of experience in shipping artworks framed with glass, and we have a proven packing method, which includes the use of a special blue mirror tape to ensure that the transported item is not damaged even if the glass is broken in transit. Our expertise and knowledge allow us to work with many auction houses from around the globe, including Shapiro Auctions that is known for its exceptional sales of fine and decorative art. 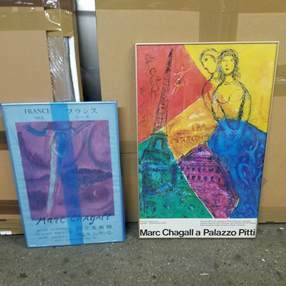 For example, not so long ago, Fine Art Shippers was entrusted with shipping several valuable prints and posters by Marc Chagall, one of the most prominent Russian artists of the 20th century. These beautiful works of art, which included a 1978 exhibition poster “Marc Chagall a Palazzo Pitti” and an original 1975 color lithograph poster “The Song of Songs,” were sold at Shapiro Fine & Decorative Art Auction held on June 2 in New York. To ship a painting or print like that is a very responsible task, so it is always recommended to hire a reliable company specializing in moving fine art over a long distance. Besides, in most case, you will need to order a sturdy wooden crate built specifically for your item. It is also worth noting that at Fine Art Shippers, we can ship a painting or print for you not only safely and professionally but also at a very attractive price. Just request a free shipping quote and see for yourself!